Former Defense Minister Moshe Arens laid to rest in Savyon. President Rivlin and Prime Minister Netanyahu participate in funeral. Hundreds of family members, friends, former and current leaders of the State are taking part in the funeral of former Defense and Foreign Minister Moshe Arens at Savyon cemetery. Among eulogizers are President Reuven Rivlin, Prime Minister Binyamin Netanyahu, ministers and Knesset members. Knesset Member Nachman Shai (Labor), who was Arens' media adviser in the past, opened the funeral procession: "Your journey, Misha, comes to an end today, 93 years of fascinating and fulfilling work. "In all the big projects you've dealt with, you always saw the human, the person behind, without which you couldn't have reached any achievement. You leave this world and you have no enemies. Thank you." 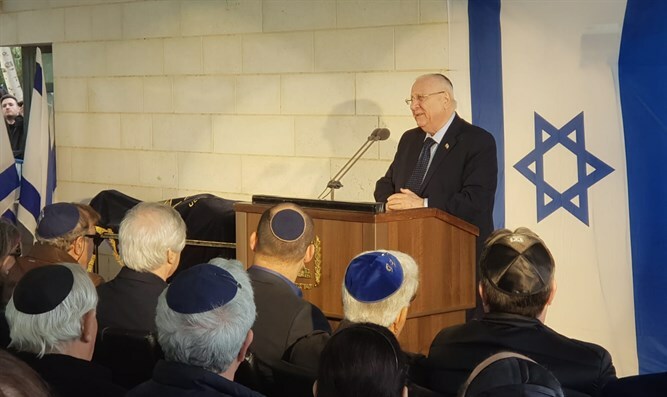 President Rivlin eulogized Arens and said, "Dear Misha, one of our eldest brothers; a teacher and mentor of the liberal national camp that I count myself among. He was of its most important leaders. A brave and loving man. A courageous man who didn't succumb to populism. A man is in the service of the people, not vice versa. "You walked like a king among us, Misha, you weren't afraid of being challenged. You have two wonderful abilities - the ability to be a man of creativity and vision and the ability to listen," added Rivlin. 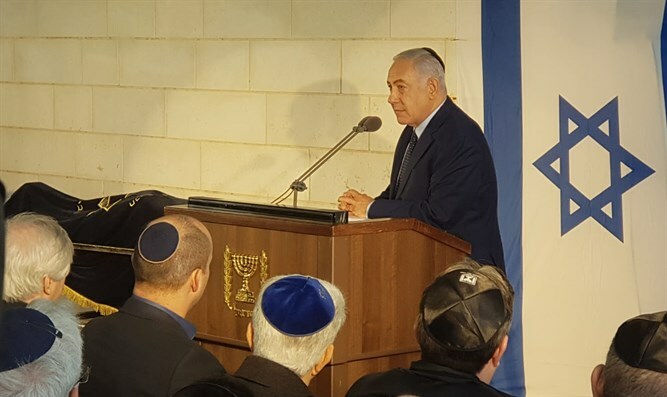 Prime Minister Binyamin Netanyahu, to whom Arens' was political patron at the beginning of his career, also eulogized: "The State of Israel today separated from a great leader and I part today from a mentor and a beloved friend whose soul was connected to mine. "A few weeks ago, I visited Misha in his home," Netanyahu said, "I warmly shook his hand the way we did a thousand times in the past, and there was always something deep and sublime about this because Misha was one of the last to shake the hand of Betar's Ze'ev Jabotinsky before his death. As a 15-year-old at the time with a gnarled hand, Jabotinsky asked him what had happened to him. Misha didn't forget this and understood that he must grasp the Zionist heritage in his hands. Jabotinsky's legacy was a strong commitment to fortifying the power of the State of Israel." Arens, who passed away yesterday morning at the age of 93, was born in Poland and as a child immigrated with his family to the United States following his father's business. At the end of World War II he was drafted into the American army and served there for two years. Upon establishment of the State, he was sent by the Etzel to aid the Jews of North Africa in organizing self-defense. In the course of his career, he served as Vice President of Israel Aircraft Industries, and in 1971 he received the most prestigious award in the defense establishment, the Israel Security Prize. Since 1973 Arens served as a Knesset and Cabinet Member until his final retirement from political life in 2003. In this capacity, he served three times as Defense Minister, for a year-and-a-half as Foreign Affairs Minister, and for more than five years served as Chairman of the Knesset Foreign Affairs and Defense Committee. In the early 1980's he served for a short time as Israel's ambassador to the United States. After retiring from political life Arens continued his public and research work. One of his most important activities during this period was publishing the book Flags over the Ghetto that was the culmination of a comprehensive study of the Warsaw Ghetto Uprising, revealing for the first time large parts of the Jewish Military Organization (ZZW). Until his death he served as Chairman of the Public Council to Commemorate the Memory and Work of Ze'ev Jabotinsky, Chairman of the Board of Governors of Ariel University, Fellow at the Institute for Zionist Strategies, and Head of the Strategic Forum.